I will be starting my next big bike ride on April 6th April 2014 to demonstrate the health benefits of a Whole-Food, Plant Based diet as well as raising awareness and money for Motor Neurone Disease and action against unsustainable Palm Oil production, responsible for the destruction of huge areas of tropical rainforests and the Orang-utans that live within it. 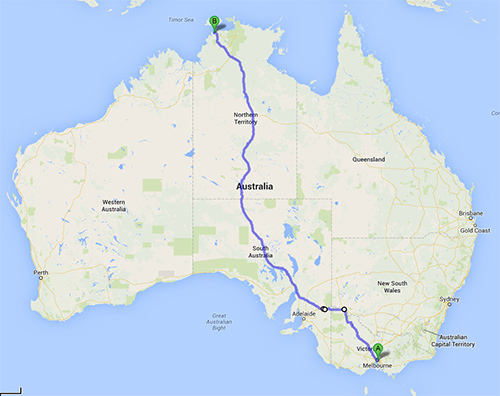 I will be riding from Melbourne to Darwin, some 4,000km in 25 days, averaging 160km per day. Could I ask you to visit my web site http://www.peddlinghealth.com/index.html and to share it with all of your friends. And please follow me on the journey as I ride through some of Australia’s wildest and remotest countryside. There will be a daily update on the ride with photographs, videos and stories as they occur.